The new Walkley Historians exhibition has been installed in Beeches of Walkley‘s window in time for the Walkley Festival. The exhibition is all about the meanings behind the street names and has been funded by the Heritage Lottery Fund. It will be on display throughout the festival. This is the first exhibition of the Historians’ new heritage project. 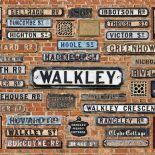 Called Walkley: Stories from the Streets, it is all about the Victorian origins of this Sheffield hill suburb. Look out for the Walkley Historians at Walkley Library this Saturday, 10am-4pm, helping to launch the Festival. We’ll be selling Walkley Ways, Walkley Wars books and Who’s Living in a Slum DVDs. Thanks to Chris Beech and Donna Beech for hosting another Walkley Historians’ exhibition. This entry was posted on June 14, 2017 by Bill Bevan in Uncategorized.